Start off a new year with poetry; there’s nothing better! Poetry is rigorous, interesting, and easily adaptable to the time you have to teach it. For its flexibility and for the multitude of lessons it allows us to teach, poetry is, hands down, my favorite type of literature. What you’ll find below are five poems that are ideal for jumpstarting the new year, my all-time favorite New Year’s poem to teach to high school students – “Burning the Old Year” by Naomi Shihab Nye (with a link to the complete lesson plan in my TpT store), and a free New Year’s writing prompt resource designed to help you enjoy poetry with your students from the first (school) day of the new year. This poem is ideal for high school students. It’s one that all students can relate to: destroy the minutia of the past year, realizing that so little of any year is worth keeping (“a stone”), and look forward to the year ahead while tiny twinges of regret crackle in our minds. The poem is available from the Poetry Foundation here: Burning the Old Year, and you can click here for an entire lesson on the poem in my TpT store that’s ready to print and use right away with NO PREP! a notable image, metaphor, sound device, or idea. Before reading, define “psyche” (n. the mindset of a person, the place where thoughts and feelings of a person or an entity develop and reside), “sloth” (n. extreme laziness or apathy), and “rhetoric” (n. the effective use of language in speaking and writing, often meant to persuade). Ask students to look for the metaphor of a snake and an allusion to weapons of mass destruction which were the reason for President George W. Bush announcing that the US had begun the military offensive called Operation Iraqi Freedom on March 19, 2003. You can also use this poem when you teach “Letter from Birmingham Jail” by Dr. Martin Luther King, Jr. and the concepts of passive resistance and nonviolent protests. This is a deceptively simple poem. Only 18 lines long and devoid of punctuation and capitalization (except for the first “W”), the persona in this poem speaks directly to the new year as it creeps into existence with sunlight and a dove’s call for the reader to see and hear. The five lines are hope-filled and compassionate; you may wish to discuss the lines that include “age” and “knowledge” and just what the author is saying about doing the best you can with what a person knows at a given point in time. I’m including this poem by Jimmy Santiago Baca even though I have to share this caveat: there is, in the third stanza, a reference to drugs and alcohol which might make the poem inappropriate for high school students, but not for students at the college level. Honestly, I love the vivid imagery in the poem and the extended metaphor of the speaker’s boots that runs throughout the poem. This poem, with its subtle ABAB rhyme scheme, washes its readers in language that is exquisite, mellifluous, and intricate; having at least a cursory understanding of the meanings of the words is absolutely essential to making sense of the poem. To help you with that, I’ve created a list in Vocabulary.com with 17 of the words in poem order. If this poem is too challenging for your students, you can enjoy its beautiful linguistic genius and gift it to yourself. I hope you and your students have a terrific new year! 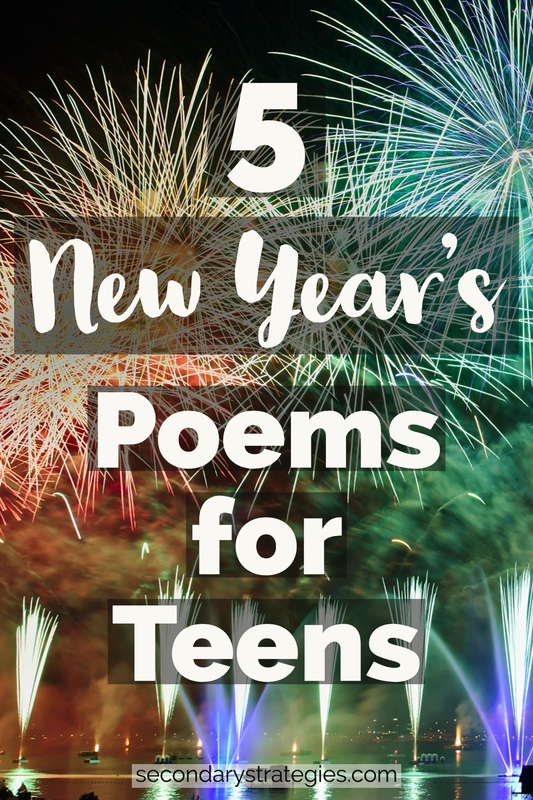 Be sure to let me know if you run across any other fantastic poems related to the New Year, resolutions, or new beginnings that would be appropriate for middle, high school, or college students. Happy New Year to you! PIN this image to save this post for future reference or to share this post with others.